In the second book of the Companions Codex, the latest series in the New York Times best-selling saga of dark elf Drizzt Do’Urden, R.A. Salvatore picks up with the fan-favorite storyline of dwarf king Bruenor Battlehammer and his bloody feud with the Orc kingdom of Many Arrows. 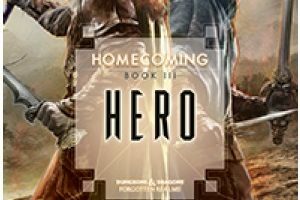 Rise of the King: Companion Codex, II is the newest book set in the Forgotten Realms campaign setting by New York Times best-selling author R.A Salvatore and the twenty sixth book featuring the Drow hero Drizzt Do’Urden. 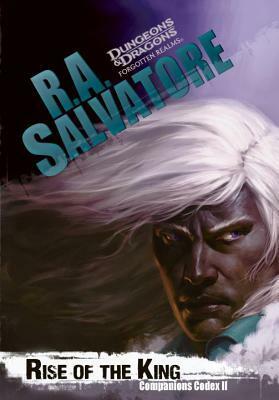 I am glad that I had previously read the rest of the Drizzt books before I started to read this, Salvatore seems to make an assumption that everyone has read the rest of his books, and not a lot of background info is given. I believe anyone who tries to use this book as a starting off point for the series will be utterly confused. I would recommend that anyone who hasn’t read the previous set of books in the series before attempting to jump into the Companion Codex, I think it will make the books more enjoyable by far. 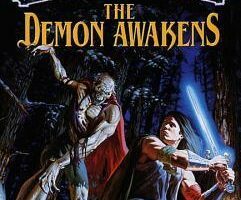 Only a few years may have passed for us since the events of the Hunter’s Blades trilogy, but for Drizzt and the Companions of the Hall it has been more than a century in the Realm. After the events of Night of the Hunter, Drizzt and the Companions are finally on the road back to Longsaddle in an attempt to see the former battlerager Thibbledorf Pwent freed from his curse and finally laid to rest. It is not long however before the Companions hear of rumors of orc raids upon the human and dwarf settlements in the Silver Marches. The Companions soon find themselves returning to Mithril Hall to find out if the treaty of Garrumns Gorge has really been broken, and to decide what that means for them. There is so much that I enjoyed about this book that it’s really hard for me to not spoil anything for anyone planning to read the book but I will do my best. 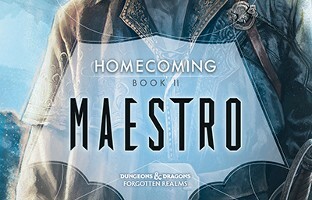 First there is the fact that finally Drizzt is back among those friends who understand and love him best, who may be able to draw him away from the dark path he was heading down. I truly started to worry about Drizzt in the Neverwinter Saga, those were dark days for him that I worried he might not come back from. There is the return of the eccentric Harpell family who are always good for a laugh and leave you wondering about the sanity of wizards in general. I thought the anticipation of the Companions return to the Silver Marches and Mithril Hall would kill me, the entire course of the book I wanted to skip forward just to see how people would react to the return of the dead king Bruener Battlehammer. There were even the return of some characters I love that I thought wouldn’t make an appearance in the world again. One of the best parts of the book, like any book by R.A. Salvatore, were the battle scenes. You can tell how much research and effort goes into each fight, you can almost feel like you are there each and every time. While initially this may come across as just another Forgotten Realms book, I felt like it really stood out from anything set in the campaign that has released in the last few years. The only complaint I have is how short it seemed to me, but every book I read seems short by the time I finish it. I once again made the mistake of starting to read a chapter or two of the book when I went to lie down for bed. Almost seven hour later, after I realized it was almost six in the morning, I had to force myself to put down the book and get some sleep before work. While this happens to me a lot I will honestly say it doesn’t happen with a book that I don’t think is worth the lack of sleep. I am already counting the days till book three releases and thinking of a reread just days after I finished going through it the first time. 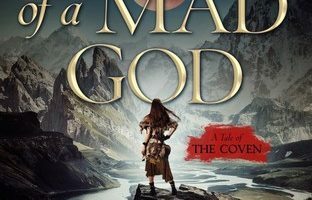 This is definatley a book for anyone who enjoyed the Forgotten Realms, and I would suggest that anyone who hasn’t read anything in the series yet do so! Rise of the King is set to be released September 30th by Wizards of the Coast. BLACKGUARDS: Tales of Assassins, Mercenaries, and Rogues — Only 7 days left!